-Cut open the top of the pumpkin and spoon out the seeds. Then spoon out the flesh of the pumpkin into a sauce pan making sure the chunks are bite-size -be sure to leave around an inch perimeter of pumpkin flesh to support the pumpkin as we will be pouring the curry back into the pumpkin to serve! -Into the saucepan with the pumpkin add 1 can of coconut milk, 1.5 cups of water, 1 cube veggie stock, 1 inch grated ginger and the coriander seeds. Cook the ingredients on a medium temperature for 20mins or until the pumpkin is soft and cooked through. – Pour the ingredients into a blender and blend until smooth. -In a wok, heat up some coconut oil and add the remaining spices and finely sliced onion cooking for 3 mins. – Throw in the diced pepper and cook for a further 3 mins before pouring in the pureed pumpkin and the can of chickpeas, finally covering the pan and leaving the curry to simmer for 30min. – Give the curry and stir and turn off the heat. Start to add in the spinach a handful at a time and stir in. 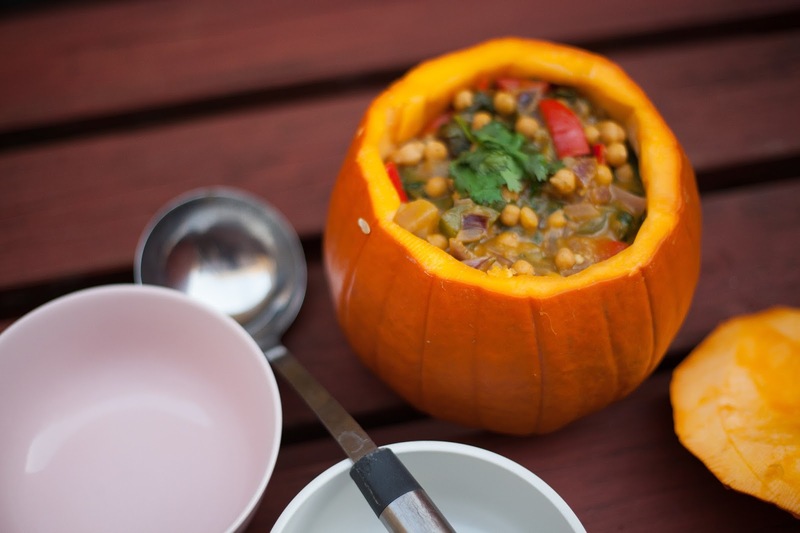 – pour the curry back into the pumpkin to serve.